Perform this mod to allow uploading new firmware to your Zipit. If if you have ver 2.01 or later on your Zipit, you will need to perform either the "3 wire" or "5 wire" mod described below. This lets you upload new firmware or fix corrupted (non-booting) ROM contents by uploading a working ROM image. For more advanced users, especially those that want to tweek the kernel build, the "5 wire" mod is recommended. This lets you upload ROM images for testing, and gives you a serial port you can connect to. You will be soldering 5 small wires to the main PCB. Two solder points are easy to get to, two are a little tricky, and one is very very difficult to solder to. Run the wires to a RS-232 level shifter. A MAX233A chip is used in the examples, but others can be used. see the RS-232 Level Shifter Page for recommendations. The MAX233A is a 5 volt chip but does appear to work at 57.6kbaud using the 3.3 volts. You connect this to a free serial port of your PC. This is an easier version of the 5 wire Developer Configuration hardware mod. 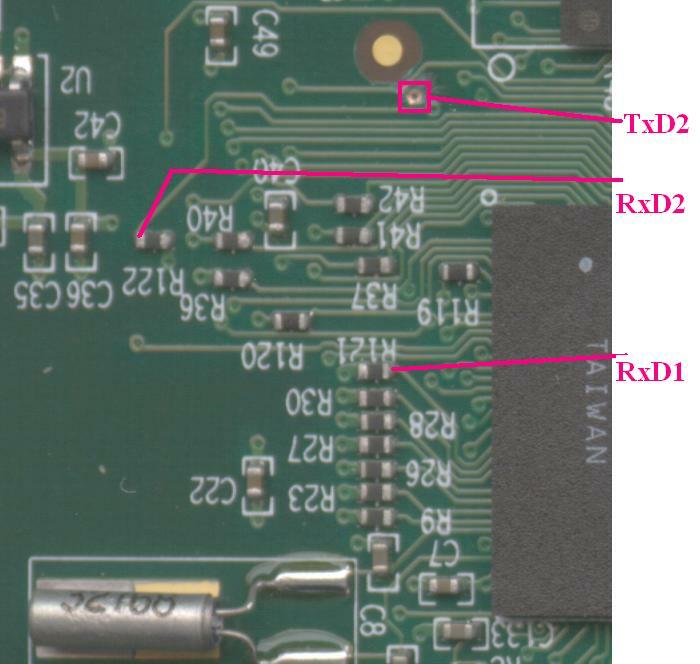 Very tricky soldering is not required (only mildly difficult soldering for one contact point). I recently got a ZipIt from a friend who didn't use it anymore. Unfortunately it had been updated to the latest firmware and after reading around I realized I needed to do the serial mod. I've soldered before, though never anything on this small a scale. Surprisingly (to me), everything went pretty well. Checked all the connections with my multimeter and it all checked out. I verified the ZipIt software still functioned correctly and got to work on uploading new firmware. Anyways, I hooked up the DB9 to my laptop and started up the flashing program. Loaded up the bootstrap program with no problem, and I got the instructions along with "ZPM .02 - 57.6Kbps new cmds" and so on. Uploading new firmware appeared to go fine, as did writing to flash. Unfortunately, when I rebooted the device without the debug pin grounded, I get nothing but a blank screen and it won't respond to anything but cutting the power. So far I've tried uploading both burn3 and OpenZipIt firmwares, and with both I'm simply getting a blank screen on the ZipIt. Any idea what's causing the problem? I've looked around the forums and the wiki but haven't seen anything on this problem yet. Inspect all possible problems before trying them one at a time. Done dispair if you're getting good feedback from the serial program -- it is doing something. First things first, what is your setup? Which serial converter chip are you using. As well what is your layout? are you powering the serial chip with an external power supply or off of the zipits internal 3.3v supply? 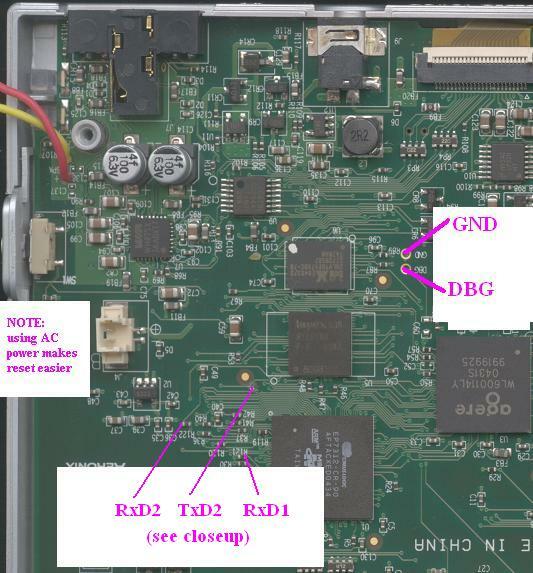 for programing with dbug you MUST use an external supply voltage to drive the serial chip. What is the voltage your driving the the serial chip with? it should be no more then 3.5v or you'll be over driving the TTL/cmos connections. An LM317T or any dedicated 3.3v regulator will work just fine. Or you can use two 1.5v cells in series for 3v. Even a 2032 button battery would work. The program is supposed to set the ports by itself but couldn't hurt, You also don't have any thing in the background trying to access that com port do you? You may want to try doing the 3 wire serial update. http://aibohack.com/zipit/serial.htm the program can be found here on the http://www.elinux.org/wiki/ZipIt page go to the how to's and click on "How to zipit tools" In there there is a linux 3 wire flashing tool. doing this method I do not know what type of medium it is supose to transfer either the bin,dat,gz or one big BIN file? One of these possible answers may help you. If all else fails it may even be advisable to use a different computer just for haha. You should have this as well: http://www.aibohack.com/zipit/zipit_parts_burn3.zip Because the upl program will ask for a loader.bin still and that loader bin is part of the burn3 so just to be safe. This page was last edited on 24 September 2007, at 12:11.